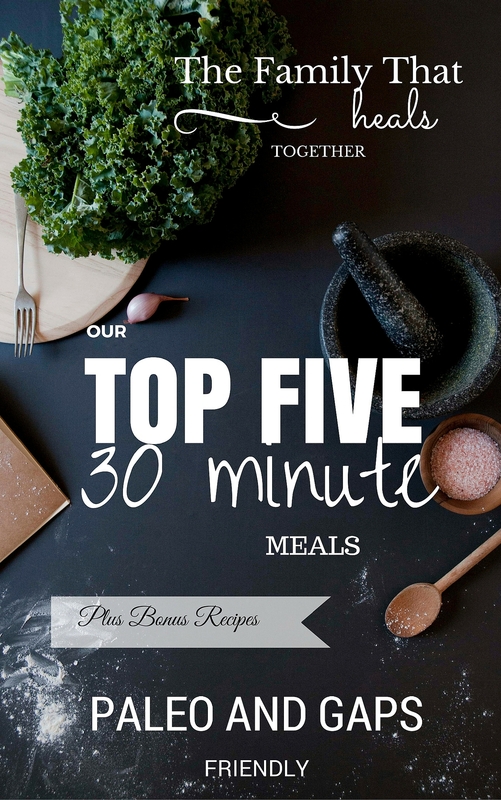 Making food kids will love is more than just recreating healthier special treats. It’s important to find ways to get veggies in ’em, too, and these homemade kale chips do the trick! Grab the recipe below. One of the main objections I hear from parents when switching their kids to real food is “My kids won’t eat ______.” Here’s the thing, mom and dad, kids WILL eat what you prepare for them, eventually. You just have to find tasty ways to prepare them. 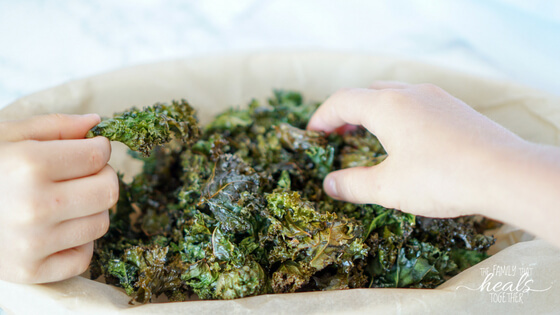 Enter homemade kale chips: the absolute tastiest way to prepare kale kids will love. If you, too, want your children to love kale (and lotsa other green veggies), take note: the yummiest way to cook veggies is to roast them in the oven with butter or ghee and get them just slightly crispy/charred. Be sure to add just the right amount and type of seasoning. Voilà. Do you need any more reasons to get this super green superfood into your kid’s diet? While kale is filled with health benefits for growing little bodies, it’s important to buy it organic, as it tends to test higher in pesticides than many other types of produce. For these homemade kale chips, I prefer to buy the organic bagged, pre-chopped curly kale. Of course, you can easily buy whole curly kale, but for some reason, I find the pre-cut, bagged stuff has a better, less bitter flavor, which I’m guessing may come from the leaves being picked earlier, as the younger leaves are less bitter than the more ripe ones. You need just the right amount of fat (don’t be stingy), and the right flavor of fat (using butter or ghee imparts the perfect buttery flavor). In addition, using just the right amount of salt, a well as a surprise dried herb gives it such a delicious taste. 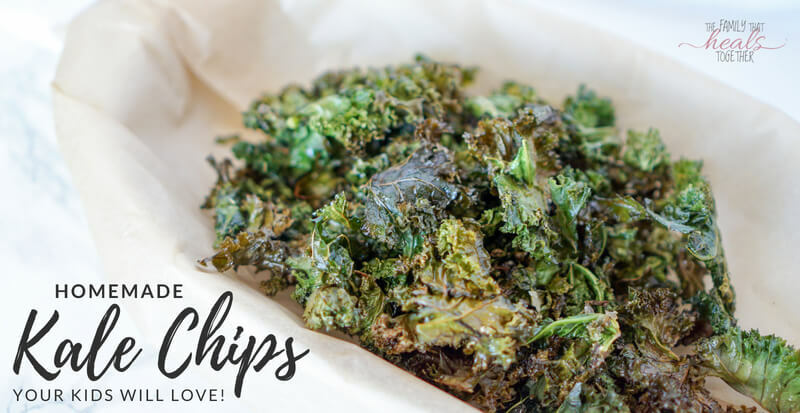 With all of the above in mind, my kids actually say these homemade kale chips taste like popcorn- and I agree! Early in our paleo journey, popcorn was one of our most-missed foods (but if you’ve read our story, you know that corn can cause some major behavioral meltdowns for one of our kiddos- read about that here). Keep in mind that greens shrink -a lot- as they cook. I start with a large baking sheet, but end up with a pretty small helping of kale chips. I usually have to make a double batch to make our crew happy, and even then, they ask for more. Place a few pats of ghee throughout the pile of kale, then add seasonings. 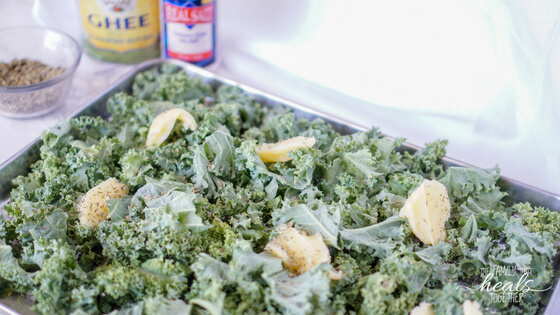 Spread kale on a large stainless steel baking sheet like this. Spread the ghee in chunks over the kale, so that it's divided up and spread out. 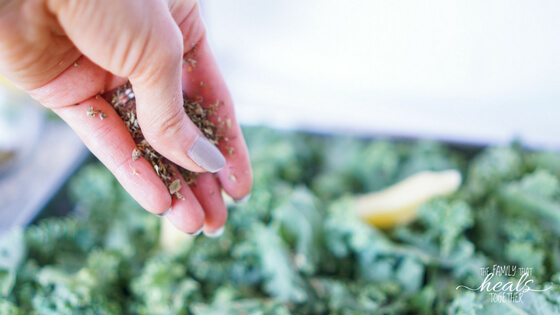 Sprinkle the salt and oregano over the whole tray of kale. Put in the oven and set a timer for 5 minutes. When the timer goes off, remove the kale and stir very well, ensuring that the melted ghee coats every bit of kale, and the seasonings are well dispersed. Place back in the oven and set the timer for another 10 minutes. Again, remove and stir the kale, then place back in the oven for another 5-10 minutes, checking halfway through to be sure the kale isn't getting too charred. Once the kale is crispy and slightly charred on the edges, remove from the oven and allow to cool before eating (or risk a burned tongue- not that I burn my tongue every time because I can't resist popping a piece of kale right in my mouth!). What looks like kids gingerly grabbing a piece of kale is actually impatient children who can’t stand waiting for mom to take photos! Be sure to make extra for sharing- one batch is never enough! Have you made homemade kale chips before? Did you love ’em or hate ’em? can oil be used in replacement of ghee?